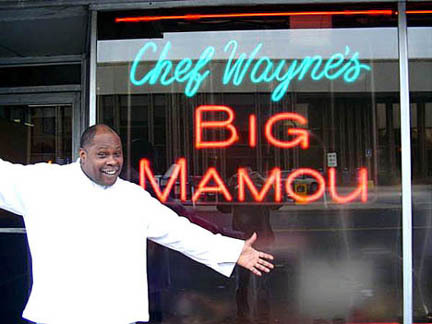 Chef Wayne’s Big Mamou is a Cajun restaurant in Springfield, MA. When my friends and I asked for walking directions from the Sheraton Hotel, the concierge expressed surprise. We interpreted his response as skepticism that three women would rather walk than take a cab so we persevered, got the directions (which were quite straightforward), and set out happily, looking forward to a drink and a nice dinner. It wasn’t long before the pretty retail facades and business addresses gave way to empty lots and corner bars, but it was still light out and we were enjoying each other’s company so it was all good. Then we walked past the bus station and turned right. Now we could see the YMCA down the street. We began to understand why the concierge thought we might want a cab. We knew the restaurant didn’t take reservations. We didn’t know they didn’t have a liquor license. There didn’t seem to be any other choices in the neighborhood so we decided to stay and wait for a table. We joined a line of people who were leaning against the wall. The guy in front of us was wearing a Columbia Teacher’s College baseball cap. V. went to Columbia for grad school. She made friends with him and his party while D. and I entertained each other. At one point, she turned back to us and said, “Tim thinks we should take a cab back to the hotel.” She also told us what he recommended for dinner. Apparently he was a regular, as, it turned out, were most of the other diners. When we were seated, perusing the menu, I noticed that on the floor at the next table was a cardboard box with an untouched six-pack of Mikes Classic Margarita. The table was scattered with crumpled napkins and empty glasses. It was clear that they were finished and getting ready to pay the bill. Before I could lose my nerve I leaned over and said, “Excuse me, if you guys are done, would you consider selling me that six-pack?” Even for me that felt a little ballsy, but I was never going to see these people again so I figured what the hell. The guy closest to the six-pack picked it up and brought it to our table. Now I was making friends. Our benefactor was eager to share tourist tips with us. He was bullish on a local bar, even recommended a particular drink, but urged us to take a cab. Et tu, Margarita Guy? Why did everyone want us to take a cab? Back at Chef Wayne’s, when Tim was getting ready to leave, he and his friend, Louis, came to our table to say good-bye. Tim reminded us to take a cab. When we were done with dinner, we gave the three remaining margaritas to a group that had just been seated and called a cab. At Chef Wayne’s Big Mamou the food is delicious, the atmosphere is funky, and the people are great. Next time you’re in Springfield, check it out. But BYOB ─ and take a cab. This entry was posted in Uncategorized and tagged cabs, Chef Wayne's Big Mamou, children's book writer, Mikes Classic Margarita, murder rate, Sheraton Hotel, Springfield, The Musing Mama. Bookmark the permalink. I probably should have written more about the food. It was delish.